Yesterday en route to Kent I was able to free up some time in an attempt to sample a revolution in bus evolution. 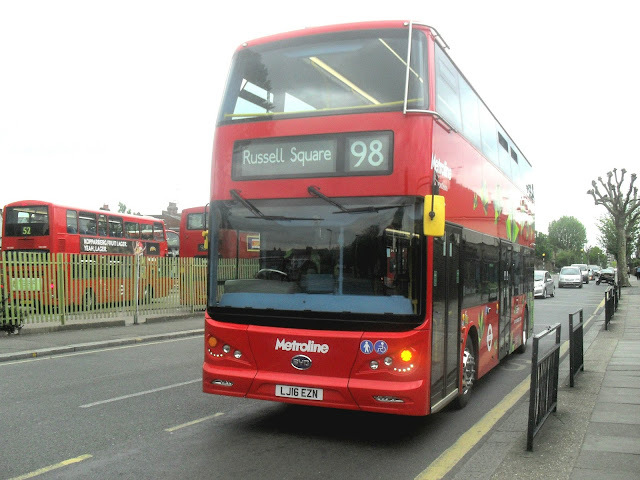 5 Chinese Build Your Dreams (BYD) fully electric double decker buses have been delivered to Metroline's Willesden garage and are now finally out in service on the 98, which operates between Willesden garage and Russell Square via Maida Vale and Oxford St. So after riding the first Borismaster I've ever noticed serious rattling on - LT52 for your information - and an old ALX400 I got to Tottenham Court Rd and waited for my first glimpse of these revolutionary buses. I waited for quite some time actually and only saw some 04 reg Presidents and a couple of 15 reg Gemini 3's on the 98. As this was mid afternoon and I still had to bus it down to Kent I asked a driver if they were out to be told they only operate in the peaks. So I decided to catch a 98 further up the route to hopefully be in the right place when they came out to play. So I boarded one of the aforementioned Presidents - not that bad as it happens - and immediately passed an electric bus going the other way. Between Oxford St and Kilburn High Rd we didn't pass anything else, so I alighted, got some stomach fuel, thinking at least I knew there would be one about 40 mins behind me. And as it happens that s what I ended up catching. BYD1472 LJ16 EZN silently pulled up and I boarded, went upstairs and waited for the future to hit me between the eyes. It must be said it doesn't look that futuristic. The front is reminiscent of a President, and if I'm honest the top deck interior does little to detract from that impression. Yes those seats are as hard as they look. I couldn't get a lower deck interior shot but there is no rear window and what seats there were looked rather crammed in. The plastic is very plastic, including the window surrounds. When I travelled on a single deck version a couple of years ago I bizarrely described it as "a tram on wheels". I knew what I meant though, a tram with a steering wheel would have been a better description. The double deck version feels like a tube train with a steering wheel, and sounds like it too - you go on one of the Northern Line trains and you have the right soundtrack. The doors on the decker are very noisy, not the action but the doors themselves crash and bang oen and shut. Acceleration is phenomenal though - I doubt there is a faster accelerating bus around and it must be said the brakes are smoother than any new bus I've been on for ages. It only appears to have one gear so no jerky gear changes either. As you can see from the pics I ended up travelling to Willesden garage, then back to Marble Arch as BYd1472 was the only one of the 5 out in service yesterday. Why that was I don't know, but we had a tense couple of mins halfway back when a lot of sirens and alarms suddenly sounded. The driver had to basically reboot the bus to get it going again. So what are my conclusions. Well I thought I'd do it in table form, marking out of 10 for a change so here goes. That gives an average rating of 5.125 out of 10 and that's about fair I think. Its good points are really good and its bad points are awful. One thing I can't get out of my head though. When these buses first arrived I watched a publicity video where a chap from TfL proudly stated that "older passengers will think they are riding a 1950's trolleybus". That's not exactly progress and I can't really see an electric revolution coming. Yes no emissions but what is the cost of charging these things. The emissions are still created somewhere. And why spend Lord knows how many millions developing these buses when you could just bring back trolleybuses - trams on tyres - and be done with it. We were stuck in the same jams after all. As a concept it's good, it's a start, but just as Edison's first lightbulb won't have lit up Wembley Stadium I very much doubt these BYD electric buses will light up the bus industry. Who knows what might spawn from them though. My word where have the last few days gone! Sorry for the lack of posts but I have been dealing with bureaucracy and that has proved rather exhausting. 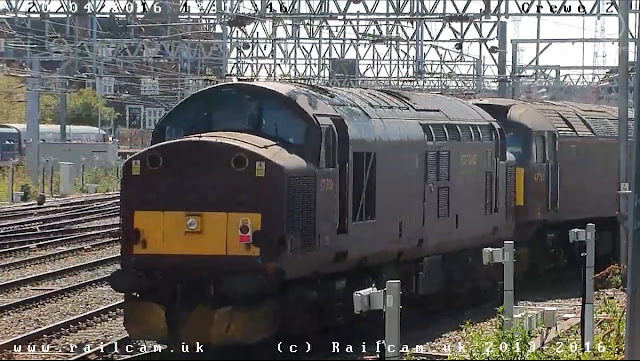 And screenshotting some superb images including the famous (Flying Scotsman), the unusual (Class 66 on a nuclear flask run) and the downright foolhardy (bloke sat a few inches from speeding freight train). Check them out on my Screenshot Flickr page, the link to which is in the sidebar. I was delighted to receive an email last week from the David Bailey of bus photography, David Bell (even initials and first name are the same). He had read my post on the new E200MMC's not being suitable for the whole Coasthopper route (see here) and decided to see for himself. David also kindly sent in some pictures for me to share with you. I will quote parts of his email interspersed with his pictures. I was very interested to read your post on the new Coasthopper Enviro 200MMCs. I decided to have a ride on one last week especially after I had been told that they were only operating as far as Wells-next-the-sea. Sure enough when we reached Wells we picked up some passengers on the quayside but then instead of turning right into Station Road to access The Buttlands the bus continued straight on down Polka Road and past the site of the old railway station before proceeding to The Buttlands via Church Street, Two Furlong Hill and Mill Road so that it was facing the correct way to return to Hunstanton. Any passengers wanting to travel further east towards Sheringham and Cromer had to disembark and cross the road to where one of the traditional Coasthopper Solos was waiting. The only ride on the new buses the passengers who joined at the Quayside got was a circular tour of Wells! Apparently there are some new Solo SRs on order for the Wells-Cromer section although even on the Hunstanton-Wells section there are some narrow spots for example in Old Hunstanton and on the approach to Burnham Market from Burnham Deepdale. At other places along the road the bus was constantly throwing up small stones from the side of the road which were peppering the underside of the bodywork. Interestingly during the hiatus over who was operating the winter service last October Lynx operated short Tempos along the whole length of the route without any problems though they took the precaution of only using their most experienced drivers on the Wells-Cromer section. I think the livery on the new buses is superb both inside and out - just a shame they will not be seen east of Wells. And what did David think of the overall E200MMC experience? Yes I liked the new Enviro 200 MMCs both inside and out and enjoyed my ride from Hunstanton to Wells although as I say it was a bit offputting to constantly hear small stones rattling into the nearside wheel arch on the coast road. Many thanks again, David for getting in touch and it will be interesting to see how use of the MMC's develops, and what happens with the Wells - Cromer section. I am hoping tomorrow to try out the very latest double decker to hit the streets of the UK - a world's first so look out for a very special post to follow. When I moved here I was actually driving, and drove regularly to Halesworth to connect up with the bus network. I noted the daily local bus and indeed used it quite often, as if you don't use these things you lose them. Or in my case it seems if you use it you lose them anyway. When I could no longer drive I found out about Suffolk Links, and regular readers will know how much I value that service, which is designed to link people with no bus service to the transport network. However, 3 weeks ago our service bus was scrapped, and Suffolk Links is also being radically altered. When Suffolk County Council told me it was "good news" the alarm bells sounded at a deafening volume. When a political statement says "good news" you know it is anything but. I knew the areas served by Suffolk Links were changing, so I asked to see maps of the new areas. None were forthcoming. Instead I was invited to a public launch day a week before the new services start. 19 miles away in Woodbridge. If everyone who uses Suffolk Links wants to go there it will be impossible to book a minibus as its tough enough to book anyway in that area.. So it would appear the Council were anxious for me not to know about what's going on. Now I know why. The new areas are based on the district and borough areas of Suffolk, because quite obviously people only want to travel within their own borough. On top of that some areas have got bigger meaning that 3 buses have been merged into 2. If you live at the extremities of these areas I have some bad news for you - you won't have a Saturday bus anymore and on some other days only a peak hour service. Let me give you an example of how this "good news" will take form. Until last April if I wanted to go to Lowestoft I would get Suffolk Links Pathfnder into Halesworth, and get on the 62 to Lowestoft. Then the 62 was scrapped. So to get to Lowestoft I then had to get the minibus to Wangford, and get the 61 from there. It's also how I used to link up with the 146. Extremely useful. However I am no longer going to be servcd by the Pathfinder bus, which is being relocated to Bungay. So to get to Wangford I've now got to get the Loes bus to Halesworth. The Loes bus currently doesn't serve Halesworth and is the hardest of the buses I use to book. Quite often I need several alternatives and intimate knowledge of the service bus times is crucial. For example last week I needed to be in Yoxford to catch the 521 to catch the 1356 Leiston. The only time I could be picked up was 1100, and that was to Saxmundham! A round trip to Leiston - 9 miles away - was going to take 6 and a half hours. That was booking 5 days in advance. So you can see it's pretty popular. In fact I was told last week passenger numbers have increased 50% in the last year. That is the one of the 3 buses condensed into 2, and my new bus to Halesworth. If I'm fortunate enough to get a booking on that I'll need to change minibuses at Halesworth to get to Wangford, or get the 88A to Southwold and double back via a 45 min wait at Southwold. It was even intimated that I might not be allowed to book minibuses to Halesworth as the new system means you get taken to your local "transport hub". It would appear one of these hubs is Darsham Station. So to get to Norwich for example I might get dropped in Darsham. If I'm lucky there might be a 521 to Halesworth, but that only runs every 3 hours, and then I'd have a 40 min wait at Halesworth for the 88. Or I'd have to get the train from Darsham to Halesworth, and the bus to Norwich from there. Oh yes another 40 min wait at Halesworth. And that's just getting there. To put it bluntly it's going to be pointless even trying to book, especially as up to 5 bookings a fortnight in advance are now going to be allowed. A lot of people who rely on these buses are going to be affected, and let's not forget these Links buses only exist because of the savage cuts to rural bus services in the first place. These changes come into effect on June 13th. 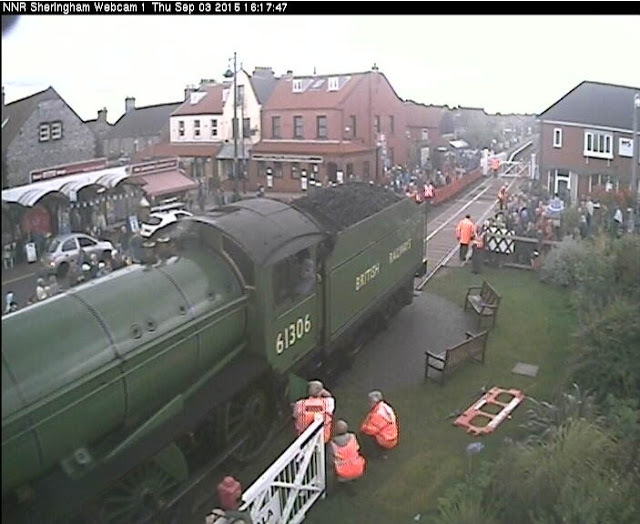 If from then on the only posts you see on here are railcam screenshots you'll know why. Oh - and before any smart Alec says I knew what is was like when I moved here I did - and it wasn't like this, just as it wasn't when I moved to Wickham Market. And people wonder why I'm so pro re-regulation. Good news? As Jim Royal would say "Good news my a***". A Bit Of A Coastcropper! I am about to say something unusual. Thank you either Norfolk County Council or Norwich City Council whichever one of you authorised chaos causing temporary traffic lights near Norwich Airport today. I'm very grateful. Let me explain. An Anglian driver kindly checked with the Stagecoach driver when he was leaving (thanks Ian) and luckily he was the next one out as SG buses turn up out of the blue at lunchtime! I went to the stop and after a few mins 37431 came round. It was at this point I was told why the MMC was on the X29 and not its branded route. 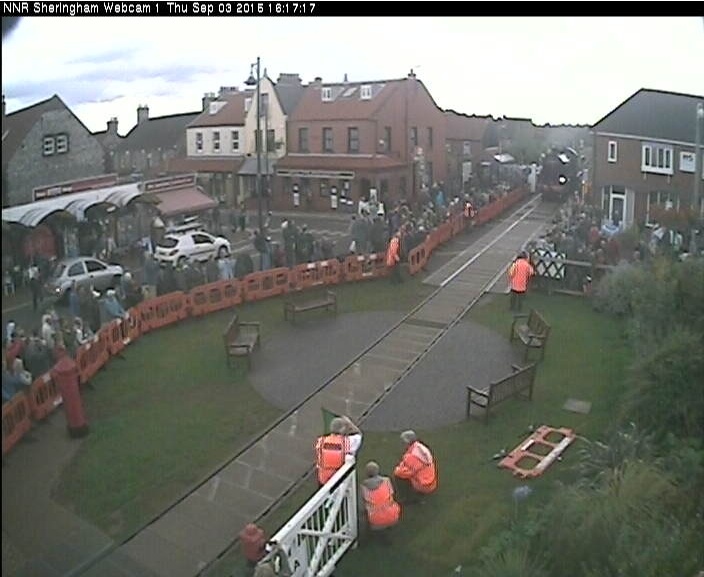 Apparently the MMC's are too big for the Wells - Cromer section of the route and cannot be used. To me this seems quite staggering that no one thought of this eventuality before the order went in. New shorter buses have been ordered but I cannot confirm if they are shorter E200's or Solo SR's. Some of the MMC's are operating between Kings Lynn and Wells, but then its the old Solos! Now my verdict on the MMC as I had the best part of 75 mins on it. The interior I think is stunningly good. All in Coasthopper colours it is mural like both sides. The orange and blue e-leather seats are just about the most comfortable standard bus seats I've sat on for ages and show a lot of thought has gone into them. Now the ride. No rattles, smooth acceleration and braking despite like the Streetlites sounding like an old Metrobus. It feels solid, has a nice engine tone and I cannot fault it in anyway whatsoever. Of course the big test will be if I think the same in 6 months, but I can't tell you how nice it was to go on a brand new bus and come off smiling. As usual the X29 became an X8 at Fakenham and carried on to Kings Lynn. So you see if those traffic lights hadn't held up the X44 I'd have ended up at Cromer staring at Solos all day without an MMC in sight. Mysterious ways!! I had an Optare Tempo for the journey back with a definite deficiency in the rear shock absorber department. I swear several vertebrae have been rearranged! Anyway if you can get on a Coasthopper MMC while they are new. You'll love them! You boring lot! 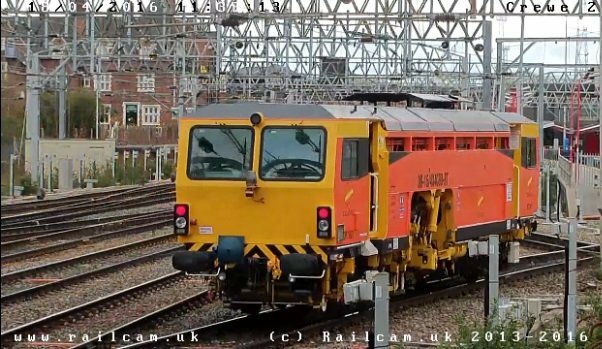 It seemed like a good idea at the time to have a little competition to see who could come up with the best railcam screenshots, but to put it mildly entries have been limited. 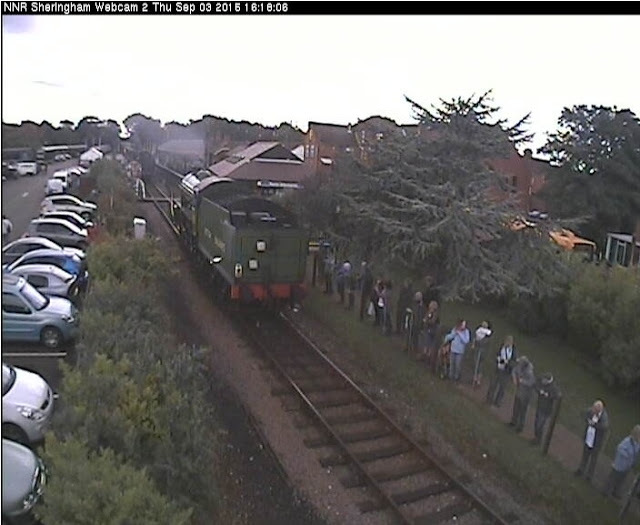 So a big thank you to Des, who not only was the only person to submit an entry apart from myself and Grahame, but introduced me to a cam I didn't know existed - at Sheringham on the North Norfolk Railway. So here is a selection of the best screenshots over the last couple of weeks. Please note all pics are copyright to the sources they are captured from and I'm grateful to the management at railcam.uk for allowing me to publish screenshots taken from their site. They have also granted me permission to set up a dedicated screenshots Flickr page, which will be constructed in the near future. We'll start with the 3 pics Des sent in from Sheringham, showing the progression of steam loco 61316 from the National Rail line to the North Norfolk Railway via Sheringham High St. Looks like it had quite a viewing and brought Sheringham to a standstill. Now here are some of Grahame's recent efforts - it has turned into quite an intense but friendly competition between the two of us, which has resulted in some amazing shots. 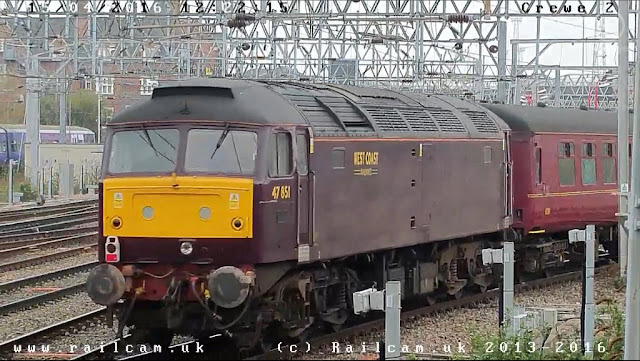 Grahame has proved quite good in capturing rail engineering vehicles as the following shots show. 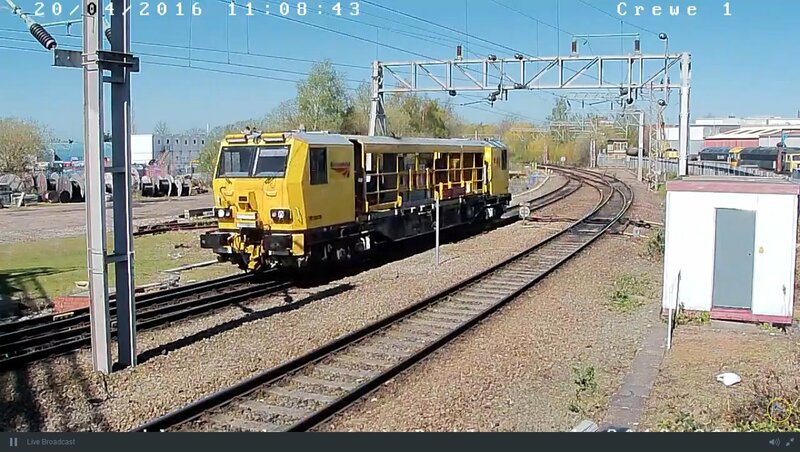 The Crewe cameras are always worth keeping an eye on as you never know quite what is going to pass next. West Coast Rail and their fleet of heritage diesels are always welcome sights. Grahame caught these two beauties as they passed the cams. Now onto my efforts. 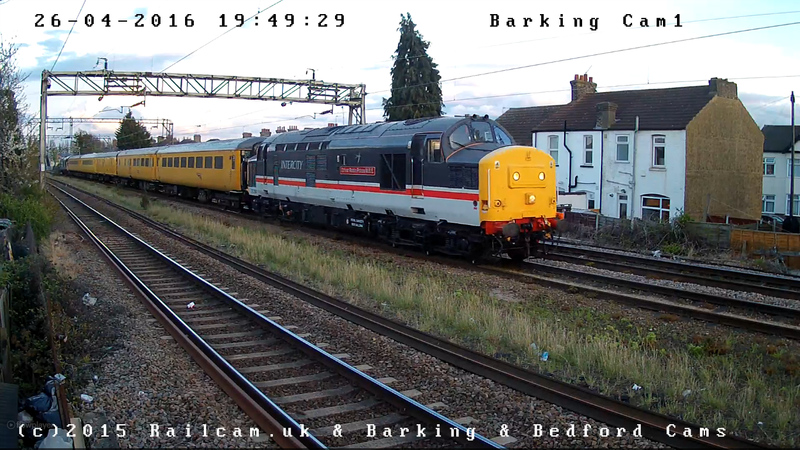 It's fair to say I am a fan of Class 37's as you may have gathered by now. So when I learned that two preserved 37's were being used on a Network Rail test rain passing the Bedford cameras this week I was ready finger poised as they passed and my word they look superb. It was very dark when they made the return journey. however that means you can see them in a whole different light, so to speak. You wouldn't believe this was from the same camera, and there is a definitely spooky element to this capture. 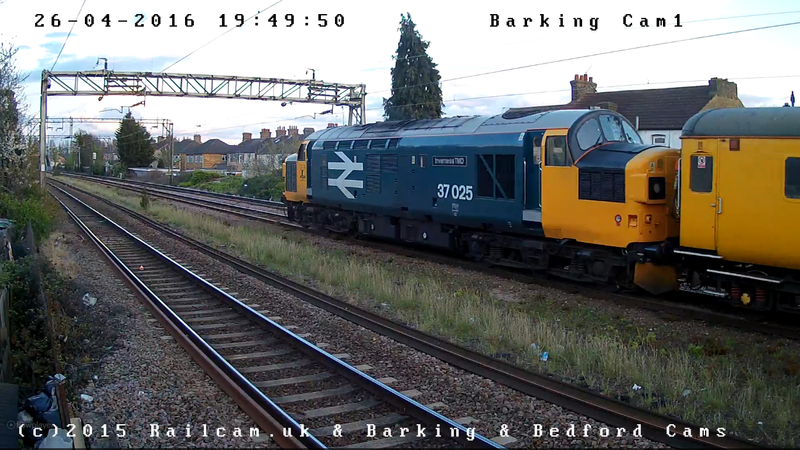 37251 looking like a ghost train! And finally something you don't see everyday. I had seen mention of a convoy heading towards York and assumed it would be a few locos coupled together. 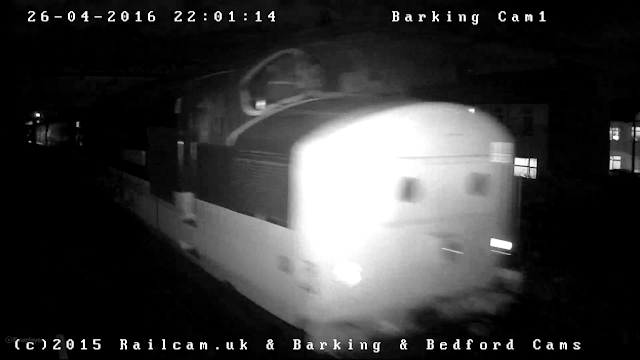 What I certainly didn't expect was 3 HST power cars from 3 different operators. They were heading to Bristol for an open day and on the way were going to pick up an East Midlands Trains HST power car and the HST prototype 41001 plus her coaches. 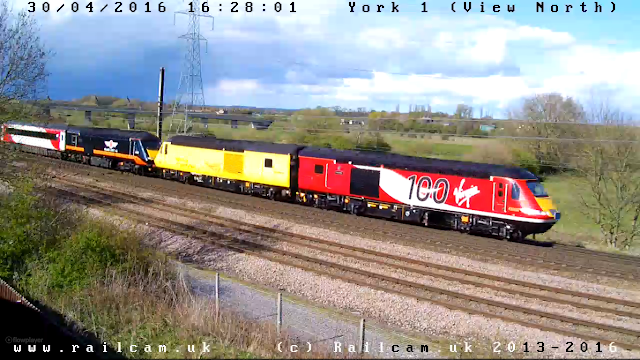 You can see the official railcam.uk video of that convoy passing both York cams by clicking here. I'm sure there will be more of these posts in the future as there is something different most days. Once again my thanks to the guys at railcam.uk for allowing me to reproduce these screenshots, and if you haven't had the railcam experience yet then give them a go - you'll be hooked rather quickly!